Electronic health records (EHR) capture “real-world” disease and care processes and hence offer richer and more generalizable data for comparative effectiveness research than traditional randomized clinical trial studies. With the increasingly broadening adoption of EHR worldwide, there is a growing need to widen the use of EHR data to support clinical research. A big barrier to this goal is that much of the information in EHR is still narrative. 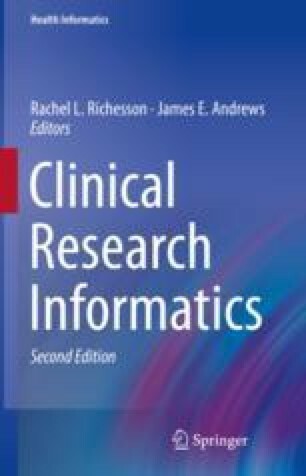 This chapter describes the foundation of biomedical language processing and explains how traditional machine learning and the state-of-the-art deep learning techniques can be employed in the context of extracting and transforming narrative information in EHR to support clinical research. NIH VideoCasting Event Summary. http://videocast.nih.gov/summary.asp?live=8062. Accessed 18 May 2011. Clinical Research & Clinical Trials. http://www.nichd.nih.gov/health/clinicalresearch/. Accessed 17 May 2011. Most physicians do not participate in clinical trials because of lack of opportunity, time, personnel support and resources. http://www.harrisinteractive.com/news/allnewsbydate.asp?NewsID=811. Accessed 31 Aug 2010. Clinical and Translational Science Awards. 2007. http://www.ncrr.nih.gov/clinical%5Fresearch%5Fresources/clinical%5Fand%5Ftranslational%5Fscience%5Fawards/. Accessed 31 Aug 2010. File:VistA Img.png – wikipedia, the free encyclopedia. http://en.wikipedia.org/wiki/File:VistA_Img.png. Accessed 18 Aug 2010. Walker EP. More doctors are using electronic medical records. 2010. http://www.medpagetoday.com/PracticeManagement/InformationTechnology/17862. Accessed 18 Aug 2010. Population Estimates. http://www.census.gov/popest/states/NST-ann-est.html. Accessed 17 May 2011. Bishop C. Pattern recognition and machine learning (Information Science and Statistics): Springer; 2007. http://www.amazon.ca/exec/obidos/redirect?tag=citeulike09-20&path=ASIN/0387310738. Accessed 15 Jul 2010. Pearl J. Probabilistic reasoning in intelligent systems: networks of plausible inference: Morgan Kaufmann Publishers; 1988. http://portal.acm.org/citation.cfm?id=534975. Accessed 12 Jul 2010. Pearl J. Bayesian networks: a model of self-activated memory for evidential reasoning. In: Proceedings of the 7th Conference of the Cognitive Science Society, University of California, Irvine. 1985. p. 334, 329. http://www.amazon.com/Bayesian-networks-self-activated-evidential-University/dp/B00071DFAE. Accessed 15 Jul 2010. Kindermann R. Markov random fields and their applications (Contemporary Mathematics; V. 1). American Mathematical Society. http://www.amazon.ca/exec/obidos/redirect?tag=citeulike09-20&path=ASIN/0821850016. Accessed 16 Jul 2010. McCallum A, Freitag D, Pereira FCN. Maximum Entropy Markov models for information extraction and segmentation. In:Proceedings of the seventeenth international conference on machine learning: Morgan Kaufmann Publishers; 2000. p. 591–8. http://portal.acm.org/citation.cfm?id=658277. Accessed 20 Jul 2010. Young T, Hazarika D, Poria S, Cambria E. Recent trends in deep learning based natural language processing. arXiv:170802709 [cs]. 2017. http://arxiv.org/abs/1708.02709. Accessed 6 Jul 2018. Krizhevsky A, Sutskever I, Hinton GE. Imagenet classification with deep convolutional neural networks. In: Advances in neural information processing systems. 2012. p. 1097–1105. http://papers.nips.cc/paper/4824-imagenet. Accessed 9 Feb 2015. Socher R, Lin CC, Manning C, Ng AY. Parsing natural scenes and natural language with recursive neural networks. In: Proceedings of the 28th international conference on machine learning (ICML-11). 2011. p. 129–136. http://machinelearning.wustl.edu/mlpapers/paper_files/ICML2011Socher_125.pdf. Accessed 9 Feb 2015. Iftene M, Liu Q, Wang Y. Very high resolution images classification by fine tuning deep convolutional neural networks. In: Eighth International Conference on Digital Image Processing (ICDIP 2016). International Society for Optics and Photonics; 2016. p. 100332D. https://doi.org/10.1117/12.2244339. Li Q, Spooner SA, Kaiser M, Lingren N, Robbins J, Lingren T, et al. An end-to-end hybrid algorithm for automated medication discrepancy detection. BMC Med Inform Decis Mak. 2015;15 https://doi.org/10.1186/s12911-015-0160-8. De Vine L, Zuccon G, Koopman B, Sitbon L, Bruza P. Medical semantic similarity with a neural language model. In: Proceedings of the 23rd ACM international conference on conference on information and knowledge management. ACM; 2014. p. 1819–1822. http://dl.acm.org/citation.cfm?id=2661974. Accessed 4 Jun 2016. Choi E, Bahadori MT, Searles E, Coffey C, Sun J. Multi-layer representation learning for medical concepts. In: Proceedings of 22nd ACM SIGKDD conference on knowledge discovery and data mining. 2016. http://arxiv.org/abs/1602.05568. Accessed 10 Mar 2016. Jagannatha A, Yu H. Bidirectional RNN for medical event detection in electronic health records. San Diego; 2016. p. 473–82. https://www.aclweb.org/anthology/N/N16/N16-1056.pdf. Jagannatha A, Yu H. Structured prediction models for RNN based sequence labeling in clinical text. 2016. https://arxiv.org/abs/1608.00612. Accessed 28 Aug 2016. Choi E, Bahadori MT, Sun J. Doctor AI. Predicting clinical events via recurrent neural networks. arXiv:151105942 [cs]. 2015. http://arxiv.org/abs/1511.05942. Accessed 9 Mar 2016.